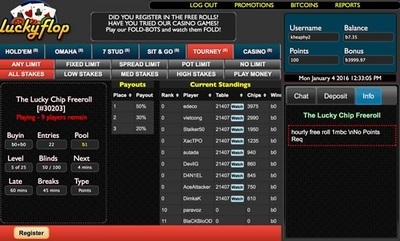 ﻿Lucky Flop is a United States friendly bitcoin poker room that supports cash games on iPhone, iPad and Android. Compete in Sit & Go tournaments or play at the Omaha and Texas Hold'em cash tables. ﻿Play bitcoin poker from the US or anywhere in the world. Works instantly on any iOS, Android or Windows Phone. Range of poker variants, including Hold'em and Omaha. Compete in Sit N Go heads up or large tournaments. Play real money poker anonymously and instantly. The recent Bitcoin revolution hasn’t surpassed the online poker scene and there are more and more BTC poker rooms. One of the best out there is LuckyFlop. 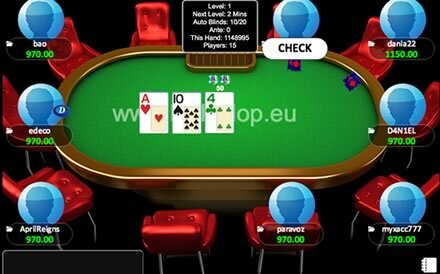 It was launched in 2014 and offers various poker games: Texas Hold’em, Omaha, and Stud. You can choose between cash games, multi-table tournaments, and SNG. As you could expect from a Bitcoin-based service, it is anonymous and players from all over the world are accepted. This includes restricted countries such as the USA for example. 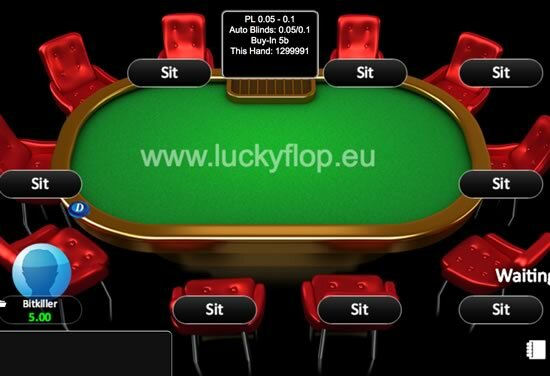 You need a simple registration to play on LuckyFlop. When you load the website, just use the Register button and fill in the required fields. They do not ask for personal details, such as real name and country, just for username, password, and email. This makes the whole process anonymous which is perfect for US citizens and players from any other country that is normally restricted. Also, there are no annoying account verifications, required documents, and boring KYC procedures. This is the beauty of Bitcoin. LuckyFlop takes advantage of another huge plus of the cryptocurrency – fast banking. Deposits are instant and they get converted in playing chips right away. Withdrawals are also very fast, as they take between 12 and 24 hours, depending on the amount requested. This is probably a bit long for BTC-based business, but it is certainly much faster than the traditional poker rooms and their usual payment methods. Their software is powered by Pro Wagers and is available on any platform. There is a downloadable desktop client for Windows and Mac, but you can also play directly from your browser. Lucky Flop made sure to cover pretty much all mobile devices out there as you can play on iPhone, iPad, and Android. Just load the page from your browser and choose the option Play Poker Now In Browser. The software is stable and intuitive, so you can easily navigate through the lobby and choose the games you want to play. The graphics are nice and pleasant for the eye, with a good color choice. 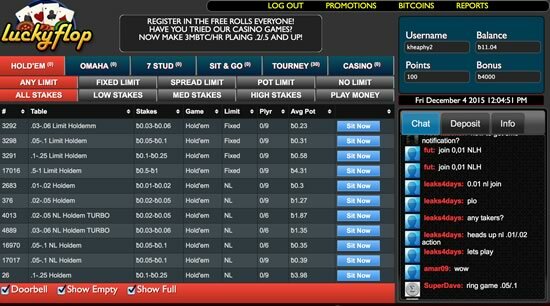 The web client also allows you to play on multiple tables which is a must nowadays. Poker variants on offer include Texas Hold'em and Omaha, both of which can be played just for fun or for real bitcoin. Stakes range from 0.03/0.06 BTC and going right up to 2-5 BTC. Sit & Go and freeroll tournaments are also available. They have a 10% rake back first deposit bonus worth 2 BTC. This might seem a bit low in terms of percentage but is eligible for any amount you deposit. It is released on a daily basis, for any day you played poker. There is no restriction and you can withdraw the released bonus anytime, but you will lose the rest of the bonus. LuckyFLop offers two interesting bonuses that may bring you some decent wins if you get lucky. If you get a Royal Flush or lose with Aces Full of Kings or higher on a cash table, you can get up to 0.2 or 1 BTC respectively. Certain terms and conditions apply like the hand must reach showdown and at least three players should be dealt in, but that’s standard for that kind of bonuses. If you are lucky enough to qualify for one of them, just send an email to the support team and claim your reward. LuckyFlop holds a number of free rolls which can help you build a bankroll from scratch or boost your existing one. There are daily tournaments with no requirement or entry fee and real money prizes, so just follow the lobby and you can take advantage of them. Additionally, there are free tournaments which require LuckyFlop points. You gain those by playing on the cash tables. You can see how many you’ve collected in the lobby. The prize pool of these contests varies between 0.1 and 1 BTC so they represent another good option to win some free cash. LuckyFlop offers a good poker platform for both web and mobile environment. Their software is comfortable and they cover most popular types of poker, including Omaha and Texas Hold'em. You can play anonymously from any point of the world, the banking is very fast, and their promotions are decent. As most Bitcoin-based poker rooms, they don’t have much traffic yet, but this seems bound to change in the future.